Living a Fit and Full Life: Get Healthy, Radiant Skin this Spring with Perricone MD! Get Healthy, Radiant Skin this Spring with Perricone MD! We’ve always believed in a holistic approach to skincare. Backed by science and research, we use the most powerful ingredients on the planet. We believe in a wellness system that incorporates anti-inflammatory diets, essential dietary supplements, and whole-body health. We never compromise on excellence and innovation because we’re on a mission to revolutionize skincare for results you can see. A no-rinse, ultra-gentle facial cleanser that works as a 3-in-1 cleanser, toner and makeup remover. Micellar cleansing water helps remove surface debris and unclog impurities from deep within pores, while smoothing and conditioning skin. A super-concentrated, fast absorbing vitamin C eye serum that combines powerful active ingredients and soothing reparative ingredients to dramatically reduce the look of under eye circles and discoloration. Specifically designed to work most effectively at night when skin needs nourishment, this velvety-rich overnight face mask delivers powerful results while you sleep. An advanced combination of concentrated ingredients visibly minimizes fine lines and loss of firmness. This coconut oil mask features a unique combination of powerful ingredients designed to work together with skin’s natural regeneration process to hydrate and soothe throughout the night, leaving skin looking radiant, refreshed and dramatically softer. Get healthy, radiant skin this spring with Perricone MD! Perricone MD is a brand that I've been hearing wonderful things about for some time now, so I was supper excited to try out some of their products. I had the pleasure of trying the products above and I'm oh so excited to tell you guys about them! 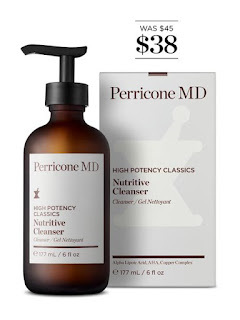 Perricone MD's Nutritive Cleanser is an absolutely amazing cleanser! It's a gentle facial cleanser that quickly and effectively removes makeup, excess oil and debris while softening and conditioning your skin. It features exfoliating alpha lipoic acid to soften, smooth and reduce the appearance of excess oil and enlarged pores to give you a clean radiant complexion that you will love. 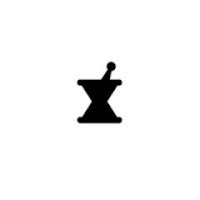 It's perfect for all skin types and I love that it doesn't strip my skin! 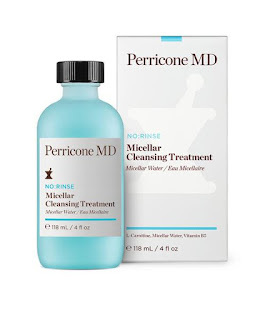 Micellar Cleansing Treatment from Perricone MD is one of my new favorite skincare products! It's a no-rinse, ultra-gentle facial cleanser that works as a 3-in-1 cleanser, toner and makeup remover. It remove surface debris and unclogs impurities from deep within pores, while smoothing and conditioning skin. I absolutely love how well it cleanses and that it doesn't dry out my skin. It's also that it's perfect for traveling when you may not have access to water. Perfect for camping, long car rides or a regular old cleaning in your bathroom. It's amazing! 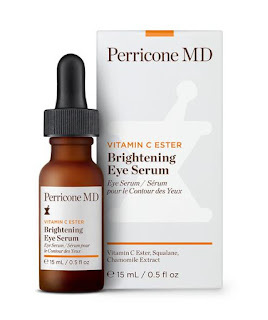 Brightening Eye Serum from Perricone MD is a must have! It's a super-concentrated, fast absorbing vitamin C eye serum that combines powerful active ingredients and soothing reparative ingredients to dramatically reduce the look of under eye circles and discoloration. It truly brightens my eye area and I love that it helps me look well rested. I also love that it helps to soften my fine lines! 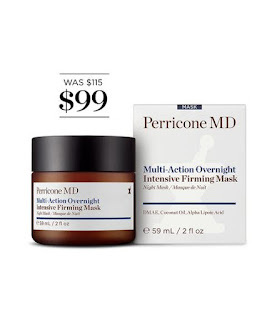 Perricone MD's Multi-Action Overnight Intensive Firming Mask is the perfect overnight mask! It's a coconut oil face mask that also features DMAE and alpha lipoic acid, which work together to dramatically reduce the appearance of lines, wrinkles, pores and loss of radiance. It helps you wake up to a radiant complexion and skin feels baby soft. It's a terrific overnight mask that you simply must try! Perricone MD has everything you need to get healthy, radiant skin this spring! Click HERE to find a store near you that sells Perricone MD! Click HERE to learn more about Perricone MD! Follow Perricone MD on social media!